New York Times reports on May 30, 2018 "Ever since President Trump pulled out of planned talks with Kim Jong-un, the leader of North Korea, officials from both countries have been scrambling to salvage the summit meeting and keep it on track for June 12 in Singapore." TOKYO — Ever since President Trump pulled out of planned talks with Kim Jong-un, the leader of North Korea, officials from both countries have been scrambling to salvage the summit meeting and keep it on track for June 12 in Singapore. A process that normally would take months is now being compressed into a matter of days, with meetings taking place between North Korean and American officials all over the world. Below, a run down of who is meeting whom, and what they might be talking about. Reporters in Beijing and New York were closely monitoring flight tracking boards in airports in both cities on Wednesday to figure when, exactly, Kim Yong-chol, one of Kim Jong-un’s most trusted aides, would arrive in New York to talk with Mike Pompeo, the secretary of state. They face a monumental task: finding a path to denuclearization. Analysts believe that Mr. Pompeo will seek to clarify the North’s position on its nuclear program, which may have gotten muddled during Mr. Pompeo’s two visits to Pyongyang to meet with Kim Jong-un. Kim Yong-chol was also present at those meetings. Kim Yong-chol has emerged as a prominent figure in the flurry of diplomacy in recent months. He led a delegation to the closing ceremony of the Pyeongchang Olympicsin South Korea in February, a controversial move given that many South Koreans blame him for orchestrating a deadly attack in 2010. This is your last free article. Pulling off a summit by June 12 will require a herculean focus on all kinds of details. Singapore will be the farthest that Kim Jong-un has traveled since coming to power in 2011, and for both Mr. Kim and Mr. Trump, there are daunting security concerns. Both Kim Chang-son, director of North Korea’s state affairs commission secretariat, and an American delegation led by Joe Hagin, a deputy White House chief of staff, arrived in Singapore on Monday to work out security measures, where and when various meetings would take place, which events would be open to the press and which officials would be in the negotiating rooms. Given both Mr. Trump’s and Mr. Kim’s fondness for photo ops, Mr. Kim and Mr. Hagin may start to scope out some visually striking spots. Kim Chang-son is sometimes called the chief butler to the family of Kim Jong-un and has looked after the North Korean leader since he was a child. When Kim Yo-jong, Kim Jong-un’s sister, traveled to Pyeongchang Olympics in February, South Korean media spotted Kim Chang-son taking Ms. Kim’s coat. When President Trump sent his letter last week to Kim Jong-un canceling— or at least postponing — the summit, one of the likely triggers was a statement from Choe Son Hui, a North Korean vice foreign minister, in which she criticized Vice President Mike Pence for “ignorant and stupid” remarks comparing North Korea and Libya. But she has been representing the North in talks with an American delegation led by Sung Kim, a veteran diplomat and ambassador to the Philippines. The two sides met on Sunday in Panmunjom, a “truce village” in the Demilitarized Zone that separates the two Koreas. The diplomats and technical experts are likely working out an agenda for the summit, and the American side is looking to secure detailed commitments from Kim Jong-un that his regime is willing to abandon its nuclear weapons program. Analysts said that Ms. Choe and Mr. Kim were likely to work on drafts of a potential declaration that could be issued at the summit, with wording from North Korea about getting rid of its nuclear weapons and a guarantee from the United States that it would not interfere with the North’s regime or demand redress for human rights abuses. “Ms. Choe is probably asking for non aggression and even the stopping of joint military drills between the U.S. and South Korea because the North feels threatened by it,” said Chon Hyun-joon, visiting professor at Woosuk University in Jeongju City. “The North Koreans are very good at getting what they want at the last minute, while it seems Trump is a little more impatient,” said Mr. Chon. Ms. Choe was an interpreter for the North Koreans during previous nuclear negotiations known as the six-party talks, which started in 2003 and eventually broke down in 2009. She is likely to have previously met Sung Kim at various conferences in Europe as well. Mitoji Yabunaka, a retired Japanese diplomat who represented Japan in the six-party talks, said that although Ms. Choe was officially an interpreter at the time, he sensed that she had more power and influence than that role might have indicated. She had an “impressive presence,” he said. Makiko Inoue contributed reporting in Tokyo and Su-hyun Lee contributed reporting in Seoul. 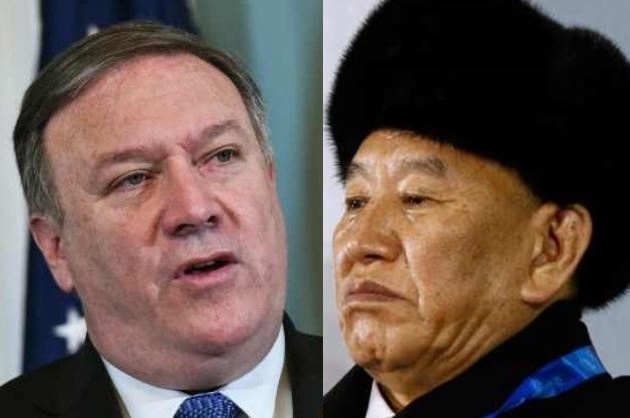 North Korea’s Kim Yong-chol and US Secretary of State Mike Pompeo are to set to meet in New York, adding to speculation that arrangements for the US-North Korea summit may be in their final stages. On Wednesday, Kim Yong-chol, vice chairman of the Central Committee and director of the committee’s United Front Department, left for New York aboard a China Air flight from Beijing. The flight is scheduled to arrive at the John F. Kennedy International Airport at 2:20 p.m. on Wednesday. According to the US Department of State, Kim Yong-chol and Pompeo will meet later this week to discuss the summit between US President Donald Trump and North Korean leader Kim Jong-un scheduled for June 12 in Singapore. At a press briefing Tuesday, State Department spokesperson Heather Nauert said that Pompeo will head to New York on Wednesday and return on the following day. The official, speaking on customary condition of anonymity, again stressed that a possible three-way meeting involving President Moon Jae-in will depend on the outcome of the US-North Korea summit. As for Kim Yong-chol’s itinerary, reports citing unnamed diplomatic sources say that he had initially booked a Tuesday’s flight to Washington DC but changed his flight upon arriving in Beijing on Tuesday. The change in Kim’s itinerary sparked a number of speculations, including that the North Korean official may have delayed his trip to consult with Beijing. A local news agency reported that Kim’s destination was changed to New York due to the symbolism a trip to Washington DC would have. Nauert, however, downplayed the symbolism carried by the location, focusing instead on the significance of the meeting. “I think it shows the importance of this meeting to look forward and look ahead to the planned meetings that the president would have with his counterpart in the future,” Nauert said in a press briefing, according to State Department transcript. Kim’s scheduled meeting with Pompeo comes as two other US-North Korea negotiations continue. Sung Kim and White House Deputy Chief of Staff Joe Hagen are in talks with North Korea respectively the Demilitarized Zone and Singapore. Sung Kim, US ambassador to the Philippines and former nuclear envoy, is discussing the agenda of the summit, while Hagen’s team is working out logistics issues.